Those of us active in the church today likely consider Sunday school as a program offered by most congregations to occupy children while their parents, unburdened by restless infants and distracted tots, participate in the adult worship service. But for the Brethren in Christ in the early twentieth century, Sunday school was a major inroad into the local community. While some outsiders were hesitant to join Brethren in Christ churches (often because of the fellowship’s strict nonconformity in dress and social/political participation), few balked at the idea of sending their children to a Brethren in Christ Sunday school. Thus, these institutions proved a powerful way to introduce young people to the gospel, educate them about church doctrine, and gently and graciously encourage them (and, by extension, their parents) to join the community of faith. For that reason, Sunday schools possessed primacy in the life of many Brethren in Christ congregations during the late 19th and early 20th centuries. An essay by Brethren in Christ pastor Ken Abell demonstrates just how powerful these outreaches could be. How the Sunbeam Sunday School gave birth to an entire congregation, after the jump. 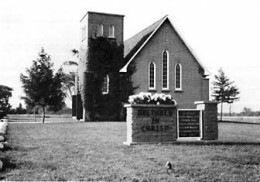 As Abell’s essay records, the Sunbeam Sunday School in Reebs Bay (near Wainfleet, Ontario), was the brainchild of George A. Sider, a deacon at the Wainfleet Brethren in Christ Church, who worked with a team of dedicated fellow churchgoers to establish an outreach into the neighboring community. In the winter and spring of 1939, [George and others] began spending time in the Reebs Bay neighborhood, knocking on doors and visiting homes and inviting everyone to the launch of the Sunbeam Sunday School. It was an exhausting time of excitement and adventure. . . .
George and his start-up team would spend each Sunday morning at Wainfleet, with many of them engaged in leadership or teaching roles. Then they would pile into rickety vehicles for the trip over bumpy roads, often stopping for a picnic and some family time along the way. After lunch, they would spend several hours in friendship evangelism endeavors in the Reebs Bay community, then head back to Wainfleet for the evening service. When they finally arrived at home, there would be chores or clean-up duties demanding their attention. 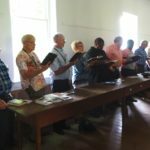 A near-capacity crowd of interested seekers participated in a celebration of choruses and gospel songs, followed by a Bible lesson geared toward the youngsters. The success of that first event galvanized the partnership and allowed them to dream big dreams. Abell describes how the Sunday school persisted — despite hardships — throughout the war years. Though at times enrollment dwindled and church leaders questioned the financial viability of the struggling initiative, the school supporters persevered. The program continued to grow. 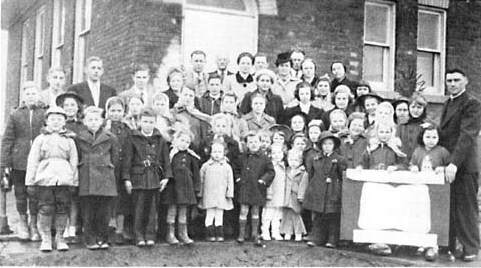 In 1957, after years of steady growth and a year-long building program, the Sunbeam Sunday School became the Port Colborne Brethren in Christ Church. 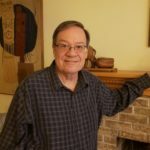 In his essay, Abell writes not from the perspective of a historian but of a (now, former) member of the Port Colborne congregation, one whose life was profoundly transformed by the dedication of George Sider and those who followed in his footsteps. His personal reflections form the heart of the essay, proving yet again how the study of Brethren in Christ history illuminates our contemporary church. In this remarkable personal essay, Ken provides insight into the function of Sunday schools among the Brethren in Christ in the early twentieth century. Read Ken’s complete essay here. You are far too kind, Devin. Thank you. Great job here. Hopefully . 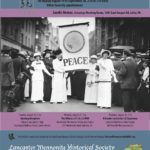 . . prayerfully, it will generate some interest in folks to see history as personal narrative.